Detel, the high-flying feature phone brand has announced a Rs 699 handset, dubbed as the Detel D1 Talkey. Detel says that this feature phone comes with a talking feature, which will be helpful especially for people who find it hard to read due to literacy challenges or have limited visual ability. Priced at Rs 699, the new phone is available for purchase exclusively on B2BAdda.com. For this feature phone, the company says it has focussed on delivering an excellent user experience at an affordable price. The highlight feature of this feature phone is the Talkey with which a user can access various features of the phone, i.e., camera, gallery, documents, etc., and the phone talks in the human voice. Moreover, taking into account the Government of India’s regulations on women safety, the new phone also provides a ‘panic button’ and ‘SOS alert’. Commenting on the launch, Mr.Yogesh Bhatia, MD, S. G. Corporate Mobility (parent company of Detel), stated,“We are committed to providing a superior experience to our users at an unmatched price. The new Detel D1 Talkey is another step towards this vision. Packed with talking feature, panic button, and dedicated keys for music, this will set some new trends in the world of feature phones.” Apart from the above-mentioned features, the Detel D1 Talkey also boasts of some more features like Panic Button, SoS alert, Dual SIM, Bluetooth, Digital Camera with flash, Call Blacklist, GPRS web browser, and wireless FM. 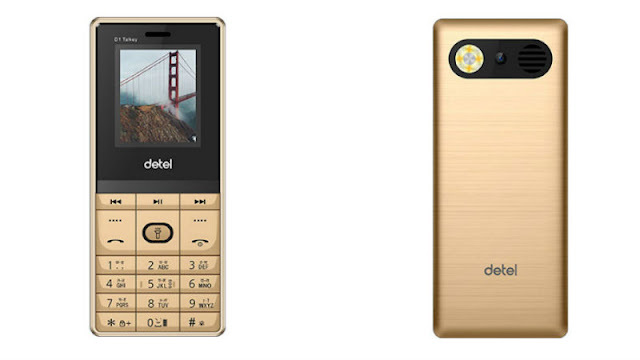 Detel is also providing one-year manufacturing warranty with this feature phone, but the device doesn’t come with 4G connectivity option. Late last month, Detel has launched four new feature phones with SoS button on board and all the priced affordably too. Detel was the first brand to launch the cheapest dual-SIM feature phone in the Indian market.